A sighting on the Mérida-Tixpéual highway provides answers to this new mystery. MERIDA, Yucatán – Cigar-shaped UFOs are less widely known than the traditional “saucer” shaped ones or those resembling spheres. This is perhaps due to the fact that in the Yucatan Peninsula, at least, their sightings and reports are less frequent. Cigar-shaped UFOs look like a rolled-up cigar, as their name suggests. Their aspect is solid and metallic, often with windows on their sides, as in a commercial airliner, but without wings or a rudder. 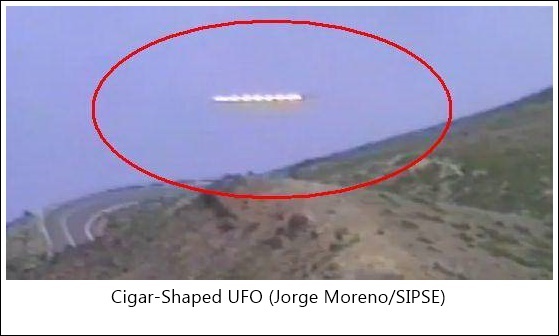 One of the earliest sightings of cigar-shaped UFOs occurred in the mid-70s, but also took place during the Belgian Wave of sightigings in 1989-1990, which led to an in-depth investigation by European governments in recent years. These objects – able to hover in the air for many minutes and then accelerate to fantastic speeds, such as 500 km per second – are generally seen by radar units that monitor air traffic, and are also sighted by commercial aircraft over the sea. In many cases, these UFOs surround airliners as though investigating them, and subsequently vanish at prodigious speeds. In Yucatan, one of the most reliable reports regarding a sighting comes from Captain Irving Peña Vidal (deceased) in the year 2003, who was able to see a flying object from his ranch, only a few kilometers from the western orbital road on the Mérida-Tixpéual highway in the company of some fellow pilots. Peña Vidal told this author that he would get together with friends and collaborators of his group FIEPAL (Latin American Spatial Research Group) to look at the sky through various telescopes. In ten years I have only received a few more reports (in Mérida and Valladolid) with regard to this sort of UFO. Peña Vidal claims having seen a mothership, and the reports from Mérida and Valladolid appear to state the same. But how can we know for sure? To answer this question it should be noted that “motherships” are at a greater altitude, cannot be seen readily, and the use of telescopes is required. Generally, smaller craft flying closer to the ground can be seen with greater ease.